Art means something different to everyone. Whether you like traditional landscape paintings, a beautiful watercolour or still life, or even the more quirky modern art pieces, there’s bound to be some form of art you enjoy. Each piece that an artist creates has a story behind it and each piece has followed its own journey to completion. But how often do we get the chance to meet those artists, hear about their stories and inspirations and maybe even see some of them in action? This September you can do just that, as Open Studios Birmingham returns for its second year (and is twice as big as before!). Open Studios gives you the unique opportunity to visit local artists in their studios and interact directly with them in their working environment. This event will be running over two consecutive weekends (8/9 and 15/16 September) with 57 artists over 26 venues opening their doors. Between 11am – 5pm across Moseley, Kings Heath and Stirchley, artists will be exhibiting and selling a wide range of creations: from paintings to jewellery, sculpture to handbags, and much more. This is a unique opportunity to meet these local artists in their own creative spaces and gain a real insight into their work and processes. Plus you might just find a beautiful new piece for your home while you’re there too. The event is FREE and suitable for the whole family and you will be supporting local artists, which is always a bonus. Most of the studios are a short walk from each other and free maps of the locations are available all over Moseley, Kings Heath and Stirchley, or you can download a pdf version here. There’s no need to book, just turn up on the day and explore. So save the date, grab an artsy friend, then get exploring Brum’s wonderful and diverse arts scene. Artists involved this year are: Tim Thomson (printmaking and drawing), Maggie Leaver (watercolour, oil paintings and limited edition prints), Sarah Cage (textiles), The Arts Probe (mixed media), Melanie Berman (embossed metal), Sundragon Pottery (ceramics), Anita Roye (oil / acrylic painting), Shaheen Ahmed (brush, ink, paper), Tipperley Hill (mixed media), Jorine Beck (illustrations, handmade pin badges and jewellery), Jill Brennan (oil / acrylic / sculptures), Susan McClure (acrylic and mixed-media painting, drawing, bead jewellery), Michele White (jewellery), Emma Hardicker (silk screen prints, oil paintings and soft furnishings), Rachel Hussey (home decor , lampshades), Layla Tutt (batik paintings, prints, textiles), Claire Griffiths (mixed media collage prints, illustrations and water colour), Pam Wernick (wet felting), Ildiko Nagy (willow sculpture, paintings), James Dawson (mixed media), Samantha Krankpod (ceramics), Sophie Handy (glass and ceramic 2D/3D mosaics), Barbara Clare Rickinson (acrylic, pastels, watercolours), Robbie Hornby (watercolour/oil/acrylic paintings), Anne Watts (textiles), Sian Tonkin (ceramics), Helen Wilson (hand made books), Sarah Sharman (sculpture), Fae Kilburn (printmaking), Hannah Leach (oil, watercolours, pastel, pen), Glenn Campbell (jewellery), Sarbjit Kaur (painting & possibly sculptures), Lizzie Wiltshire (lampshades and other textiles), Artworks Studio (oil paintings, mixed media, sculpture), Ruth Green (printmaking), Sue Bibby (embroidery), Claire Wainwright (stained glass), Kevin Thomas (photography), Katie Robbins (ceramics), Andrew Mason (glass and gold), Imogen Morris (embroidery), Carolyn Carter (photography), Esme Munro (acrylics on canvas and upcycled furniture), Gosia Weber (leatherwork), Karoline Rerrie (screen print), Faith Pope (jewellery), Kiya Corrales (jewellery), Tsz Wan (illustration), ArtGeqo (stained glass and mosaic), Janice Rider (paintings/drawings/mixed media), Jess Mikhail (illustration), Lenora Minto (glass, metals & ceramics), David Minto (illustrations and portraits in inks and acrylic), Owen de Visser (photography & prints), Wendy Palmer (acrylic and oil paintings), Melanie Wilkinson (expressive ink illustrations, life drawing, ink, nature photography), Gareth Austin (oil paintings). For more information, you can visit the Open Studios website. 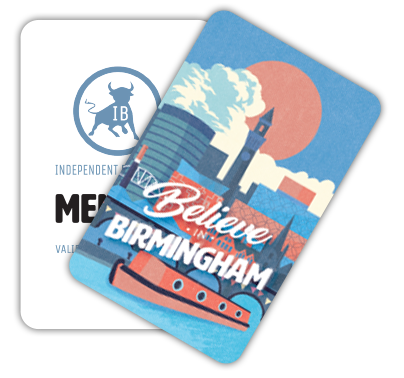 Join over 18,500 Brummies and grab yourself an Independent Birmingham Membership Card. 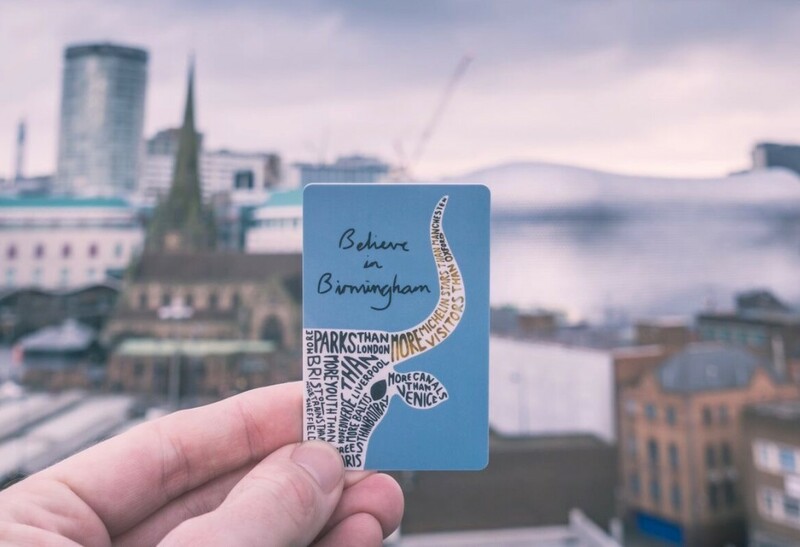 Enjoy fantastic year-long discounts and deals at over 105 of the very best independent cafes, bars, restaurants, pubs, theatres and shops in Birmingham – including: Digbeth Dining Club, The Electric cinema, Simpsons, The Wilderness, Carters, Lasan, Birmingham Hippodrome, Adam’s, 18/81, Zindiya, The Meat Shack, Purnell’s, Harborne Kitchen, BoneHead, Bodega Bar Y Cantina, Wayland’s Yard, Purnell’s Bistro, Buffalo and Rye, mac Birmingham, Gaijin Sushi, Fiesta del Asado, 40 St Paul’s, The Plough, Hare and Hounds, Birmingham Repertory Theatre, The Lord Clifden, The Jekyll And Hyde, The Church, Bourne and Co., The Rose Villa Tavern, Cherry Reds, The Prince of Wales, The Loft, Laghi’s Deli, Medicine Bakery, The Paper Duck, Town Hall Symphony Hall, Snobs, The Clean Kilo and many more.